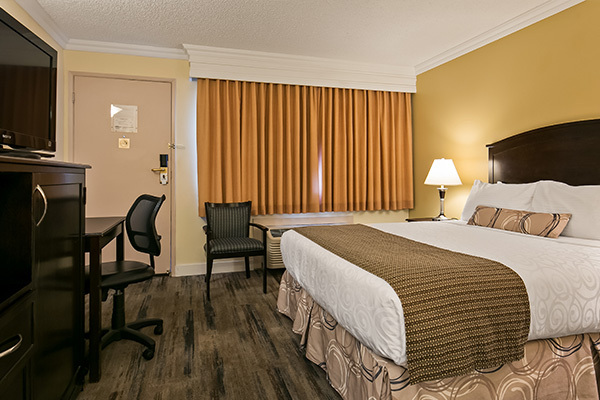 At the Best Western Plus Burnaby Hotel, every one of our 137 guestrooms is tastefully furnished and outfitted with numerous modern amenities including a 43" flatscreen LCD TV, AM/FM alarm clock radio, mini-fridge, free wireless internet, and adjustable climate controls. 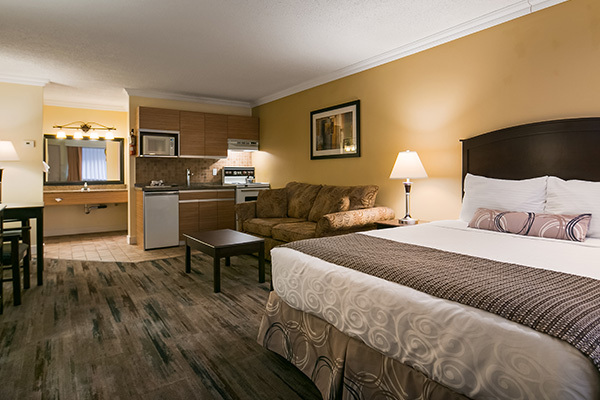 When staying at our BEST WESTERN PLUS Burnaby accommodations, you can count on being provided with all the comforts of home: in-room hair dryers and irons and ironing boards will ensure that you and your clothes look the best. Complimentary Seattle’s Best Coffee will help you get going in the morning, and in-room movies will invite you to kick back and relax at night. 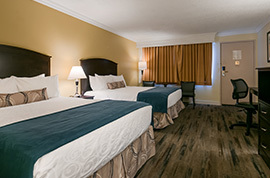 Accommodating up to four guests, our standard Two Queen room features two comfortable beds, complimentary high-speed Wi-Fi, mini fridge, TV, hair dryer, coffee brewer, iron and ironing board. 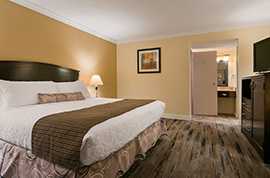 Double rooms are ideal for families or groups requiring hotel accommodations. Accommodating up to four guests, our standard Queen room comes with a Queen sized bed, complimentary high-speed Wi-Fi, mini fridge, TV, hair dryer, coffee brewer, iron and ironing board. These rooms offer excellent value for your stay in Burnaby, BC. 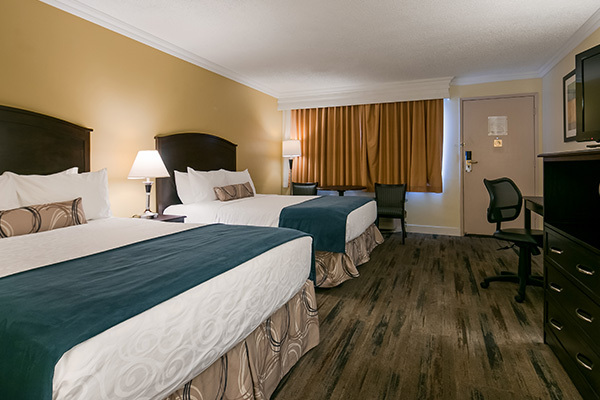 Accommodating up to four guests, our standard Queen room comes with a Queen sized bed, complimentary high-speed Wi-Fi, mini fridge, TV, hair dryer, coffee brewer, iron and ironing board. Our Kitchenette Studio offers the cozy ambience of our standard room with Queen sized bed, but with additional kitchen facilities including stove, microwave, and refrigerator for when you can’t make it to our on-site restaurant. 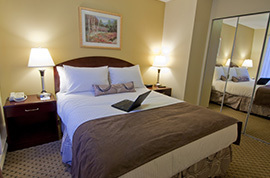 Our Bedroom Suite offers spacious, upscale, apartment-style lodging. With a separate living room and bedroom with Queen sized bed, a sofa bed, and a full kitchen unit, you will feel right at home with plenty of space to move around or kick back and relax. 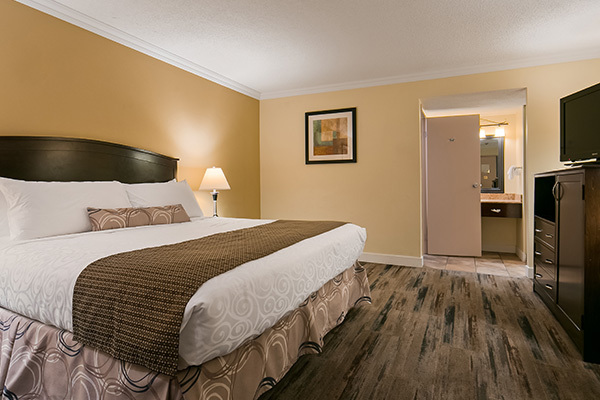 Perfect for guests traveling with a family or large group, this suite offers exceptional space and upgraded Kitchenette Studio with a King sized bed. 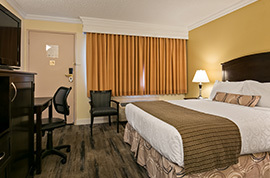 In order to accommodate all of our guests, we have smoking rooms for Two Queen, Queen and Kitchenette Studios on property where the guests can smoke inside the rooms. Please call the hotel for more information. Please note that there is NO SMOKING allowed on the balcony as it is considered part of the room. Guests are not allowed to smoke inside the non smoking rooms as there is a significant room recovery fee for guests who do not comply. We recognize that family members come in all shapes, sizes, and species, which is why we offer pet-friendly rooms, ensuring a hassle-free trip with your canine companion or feline friend.